Have you noticed your hands looking more bony and hollow over time? Are the tendons on the back of your hands more exposed? Unfortunately, this is a normal sign of aging. And even more unfortunate is the fact that hands are an easy “tell” for someone’s true age. 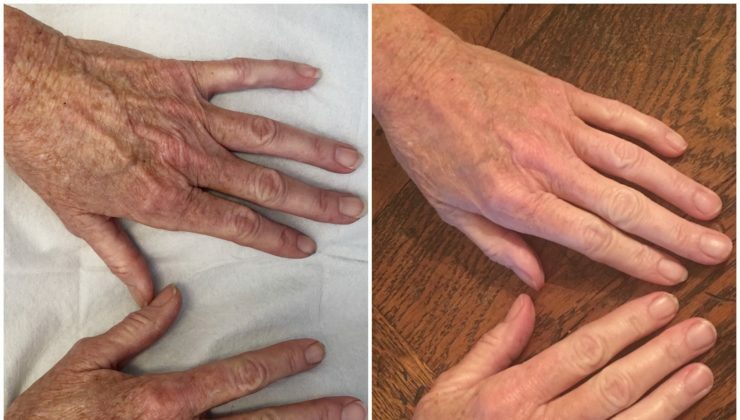 You can have all the surgery and filler in the world, but if your hands aren’t addressed, they can be a less than subtle tell of aging. There are several options – dermal filler or fat grafting – to fill in the hollow areas of your hands. Both of these options can be done in an office or operating room setting, although dermal fillers are typically done in an office, and fat grafting is usually done in the operating room. Restylane Lyft, made by Galderma, is dermal filler made out of hyaluronic acid, which can provide structure and volume to hands that have begun to hollow. In the office, typically 1.5-3.0 syringes are needed for 1 hand (or 1.5 – 3.0 cc of product). Results are immediate, and should last about 1 year. Radiesse is made by Merz Aesthetics, and is a dermal filler made out of the chemical calcium hydroxyapetite. This is another great product to restore volume and camoflage tendons in the hands. 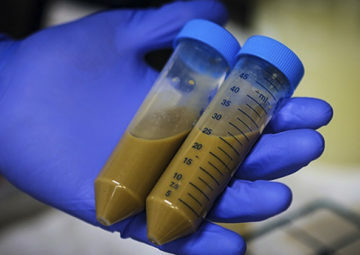 In the office, usually 1-2 syringes are needed for 1 hand (or 1.5-3.0 cc of product). Results of Radiesse are also immediate, and should last about 1 year. Fat grafting is a fantastic, long term solution to rejuvenate aging hands. The process involves using liposuction to take out a small amount of fat, that is then processed and injected into the hands. Some of your fat will be absorbed by your body, so it’s typical to overfill it by about 20-30%. Results should last for years, since we are replacing the fat that was once in your hands. Fat grafting should have a rejuvenating effect on the skin of your hand as well, with smoother and healthier looking hand skin. To truly enhance the skin quality of the hand, I recommend PRP (Platelet Rich Plasma) with Microneedling. PRP is what is left over after your blood is spun in a centrifuge, and promotes collagen growth. This is applied to your skin, and then driven in to your skin with the microneedling pen. This procedure helps to get rid of sun spots, redness, and fine lines on the hand. Patients will often lean towards a dermal filler such as Restylane Lyft if they have never had any hand rejuvenation procedure in the past, and will lean towards fat grafting if they are familiar with dermal fillers or simply want a more permanent solution. Why Choose Dr. Roy Kim? I’m a board certified plastic surgeon with years of experience in aesthetic beauty. However, I also did a Hand Surgery Fellowship in my training. I am very familiar with the anatomy of the hand, and can ensure that any rejuvenation procedure with me will be done carefully, correctly, efficiently, with a minimal amount of swelling and bruising. Injections in the hand should be done by an expert such as myself to avoid any damage to the tendons, blood vessels, ligaments, nerves, muscles, and other vital structures of the hand. If you are uncertain if you are a candidate, ask for my Patient Care Coordinator at info@drkim.com and send in your photos of your hands. I can look at your photos and help you determine if you are a good candidate before coming to my office. There is no charge for this service.